Howard Hotel Paris Orly is located a 5-minute drive from Orly Airport and a 20-minute drive from Paris. With a 24-hour reception and free shuttle to the airport, the hotel is in front of the T7 tramways stop, which goes to Orly Airport, Rungis International Market and Villejuif Louis Aragon Metro Station. 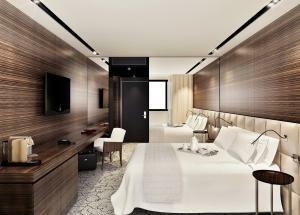 Each room is air-conditioned and includes a desk, telephone and flat-screen TV with satellite channels. All of the rooms at Howard Hotel Paris Orly feature a marble en suite bathroom, a minibar and free WiFi access. Air conditioning is available throughout the hotel. A buffet breakfast or an express breakfast is served every morning. Guests can try the cycling machines while watching TV in the hotel’s fitness room. A sauna and a hammam are also available and guests can enjoy a cocktail in the Howard Café. The 285 bus, from the Centre Commercial Athis Mons stop, goes to Villejuif Aragon Metro Station and to RER C, providing direct access to the Château de Versailles. Long-term parking is possible on site, at an additional cost.